Welcome to the Machine 475 Blog, complete with posts about the Machine 475 project, a music/art collaborative based in Boston and its community of loyal followers. 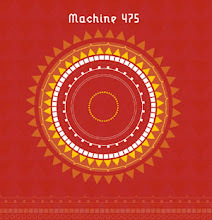 Formed in January 2006, Machine 475 is an ambitious prog-pop, multimedia project. Pop, rock, alternative, techno, trance, bluegrass, spoken word: it’s all here. Enjoy. I've figured it out: this is the better way to add the tracks. In early 1981, two undergraduates at Cambridge University in England, Richard Lewis and Mark Tomblin, decided to make a record. Both were members of the college party band The Wobbly Jellies, which played cover songs at drunken parties, and which even supported Elvis Costello when he visited the campus to play. The two decided to work on two minimalist disco tracks, given their love of Chic and Gang of Four, and to call themselves the Jellies. They booked a few hours of studio time at the local Spaceward Studios, and went in one afternoon without even a demo of the project. Recording went smoothly, given the very modest musical talent of the band, and a tape loop of kick and snare drums was created and then extended to five minutes, the tape itself looping around a pencil held by Lewis, in true Sgt. Pepper fashion. He then proceeded to play bass (badly) over the loop, using a guitar so cheap that the engineer had his work cut out for him, just to get the sound decent. Overdubs involved real handclaps, and Tomblin's overdubbed guitar effects, followed by a girl chant performed by the Wimpettes, the Wobbly Jellies backing singers, Frances and Justine. The two five minute tracks, "Jive Baby on a Saturday Night" and "Conversation", were released as a single, although 'released' is rather too ambitious a word for this ultimate home-made record. Lettering was done by Lewis and his sheet of Letraset rub-on lettering, and 500 were delivered to Lewis and Tomblin. The combined budget for this production was about 500 pounds. Expectations were understandably low, given the strangeness of this music, which did not sound like anything else out there in 1981 (or since), and the fact that no promotion was done for the record (almost). This was the only activity for the Jellies, who were convened just for this project. The songs were never performed live, and the band broke up (graduated) soon after the recording was made. Only two more details from 1981 are worth mentioning: a copy of the single, mailed to the BBC, found its way into the hands of legendary dj John Peel, who played it on his late night show; and Lewis delivered about 30 copies to the Rough Trade record store in London. "I walked into the store, the manager took a look at the record, put it on his turntable, played the first 30 seconds, decided it sounded alternative enough, and bought them all from me right there," says Lewis. This was, after all, the end of the punk rock era in London, and the anti-corporate vibe was still in the air. And that was the end of the story . . .
Fast forward 27 years, to December 2008, when Lewis and Tomblin were finally tracked down by Michael Goldstein, a dj with WFMU radio in New York. Unbeknownst to its creators, the record has emerged as one of the most sought after items in the world of hipster vinyl, loved by both fans of early do-it-yourself vinyl recordings, and lovers of early minimalist disco. Fans now include Thurston Moore of Sonic Youth, Paul from Franz Ferdinand, DJs around the world, including Mark Ronson, and many others. The 30 copies delivered to Rough Trade in London have made their way around the world, thanks to the internet, and the song has been part of dj mixes for twenty years, released on a compilation in Japan, and is even available as a ringtone. Its incredible rarity has been part of its appeal, since the only other copies have been in Richard's mom's garage for 27 years. 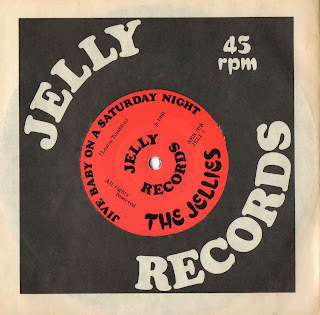 Plans are now underway to create an album of songs inspired by the Jellies' sound, soon to be released on Trunk Records. The highlight of Richard's year has been meeting Thurston Moore and giving him a second copy of the single, after the guitarist apparently wore his out playing it so much. And the moral of this story? If you make art from your heart and have the guts to put it out into the world, you never know how it will return the favor. And here's the track itself! A few weird art dudes with computers, guitars, theremin, talented friends, and a sound system ready to blow your mind!